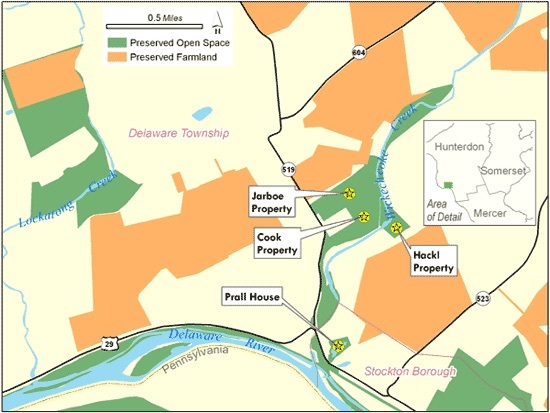 New Jersey Conservation Foundation’s Wickecheoke Creek Preserve, located in the Western Piedmont region in Hunterdon County, follows the course of the beautiful Delaware River tributary, from its headwaters on the Croton Plateau, through its dramatic descent to the Delaware River at Stockton. The Wickecheoke is home to beaver, mink, herons, hawks, turtles, long-tailed salamander and nearly 400 species of native plants. In addition, the Wickecheoke Creek’s waters flow directly into the D&R Canal, which serves as a source of clean drinking water for 1 million people in central New Jersey. Each November, New Jersey Conservation Foundation and the Delaware River Mill Society honor the memory of the late Donald B. Jones, a former New Jersey Conservation Foundation President and state conservation legend, and his wife Beverley with the Donald and Beverley Jones Memorial Hike that annually provides some 300 attendees with guided tours of our Wickecheoke Creek Preserve. Donald Jones was the driving force behind preserving three historic Hunterdon County properties – New Jersey’s last covered bridge (Green Sergeant’s Covered Bridge in Delaware Township), Prallsville Mills in Stockton and the Locktown Stone Church in Delaware Township – which are located along the preserve. Our preservation efforts in the region started over 35 years ago and protect the Wickecheoke Creek’s natural features, help maintain water quality, control soil and sediment erosion, preserve significant natural and historic areas and protect wildlife habitat and farmland. The Wickecheoke Creek Preserve is open to the public for hiking, fishing and nature observation at various points throughout the region including the Bruce, Cook, Hackl and Jarboe properties which have been preserved in recent years. The historic, 18th century John Prall House, preserved by New Jersey Conservation Foundation in collaboration with the Delaware River Mill Society, is located along New Jersey’s first scenic byway on Route 29 in Stockton and serves as the trailhead for the Wickecheoke Creek Preserve. 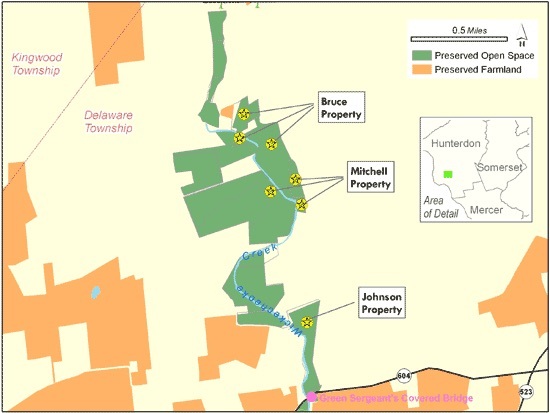 To learn more about New Jersey Conservation Foundation’s preservation work in the Wickecheoke Creek Preserve, please contact Alix Bacon, NJCF Western Piedmont Regional Manager, at 1-888-LANDSAVE (1-888-526-3728) or alix@njconservation.org.